This is one of those posts that was supposed to be one thing and then it turned into another. Well — almost. I was remembering my grandmother's fried chicken breasts. They were so perfectly and evenly thin and crispy brown while retaining that delicious moisture in the meat. 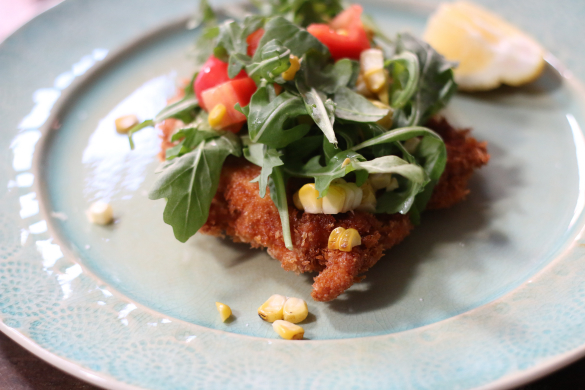 Then I thought, her chicken was also similar to a veal milanese that I enjoy from time to time at a local restaurant. 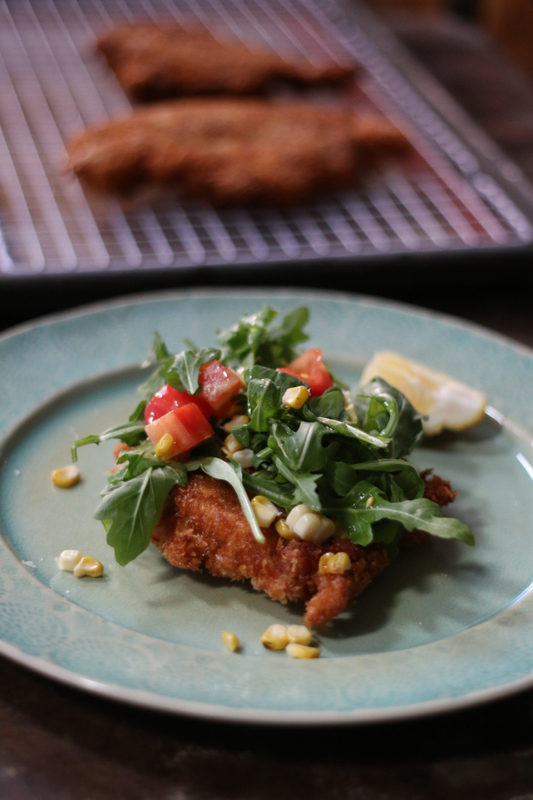 So with a few summer ingredients in the fridge, I am still frying chicken like my grandmother did and I'm just going to turn it into a summer chicken milanese. 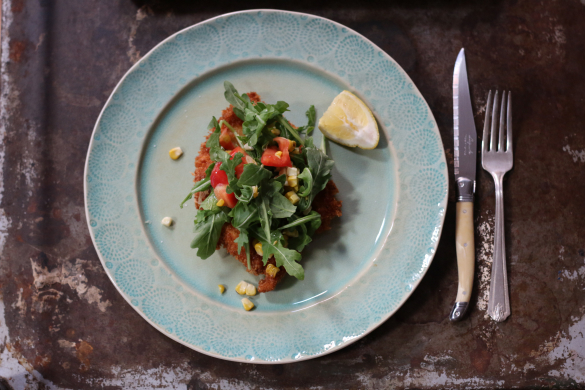 Simply shave the corn off the cob and toss with the arugula and tomato. Reserve keeping cool. 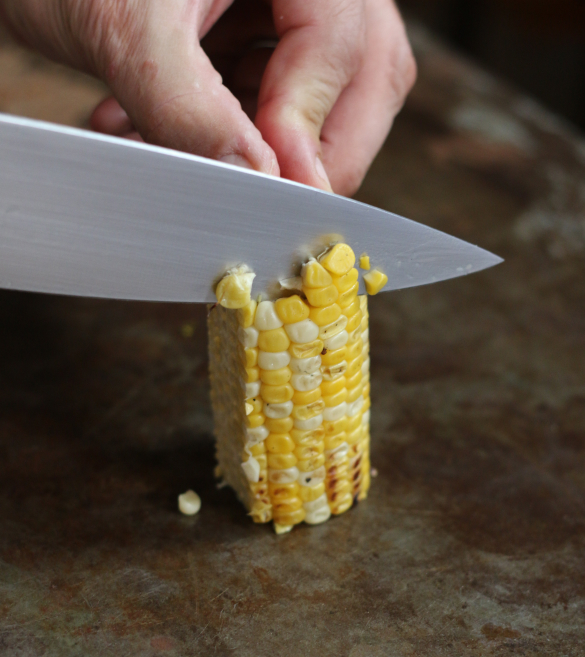 Place the breast pieces between sheets of wax paper and pound to 1/4" thick using a kitchen mallet. When it comes to the prep work for frying, it's good to have your dredging stations mis en place so you can dip with little mess when the chicken is ready. Heat peanut oil in a frying or cast iron pan over medium high heat. 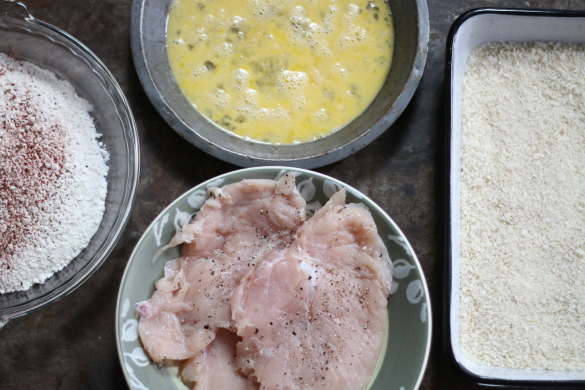 While heating the oil, dredge the chicken through the flour and then into the egg. 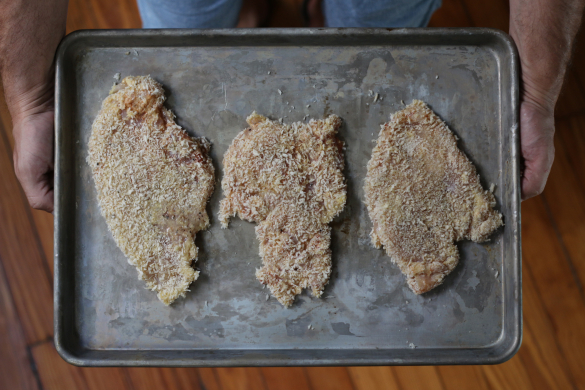 Finish by dredging through the panko bread crumbs and place them onto a sheet pan. Lower the chicken into the now hot oil and reduce heat to medium. You want a light golden brown crust. 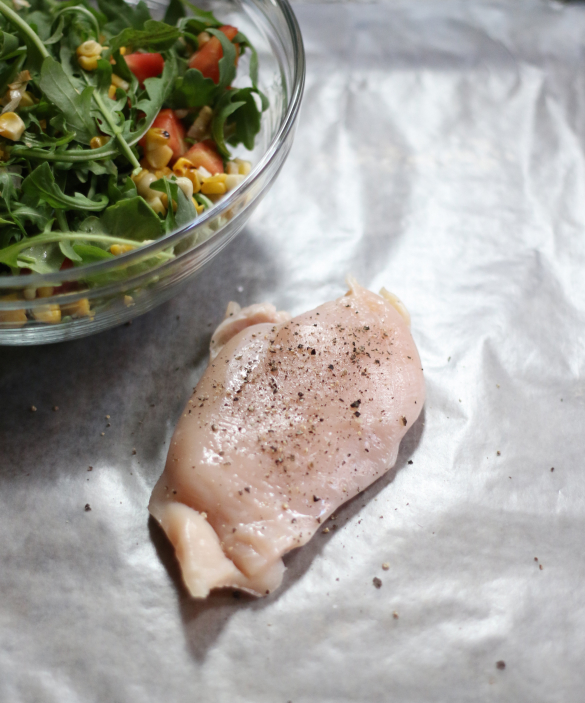 With chicken this thin and in a hot pan, 3-4 minutes on the first side before flipping and cooking another 3 minutes on the second side will do the trick. Remove from oil, placing on a rack to cool slightly before serving. 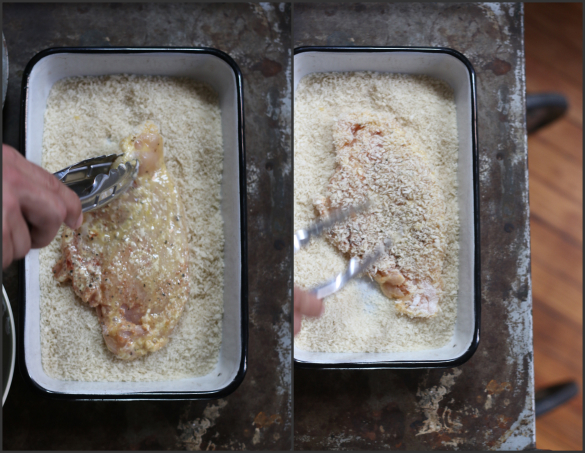 Plate the chicken, adding a sprinkling of additional salt. Toss on your salad mixture. 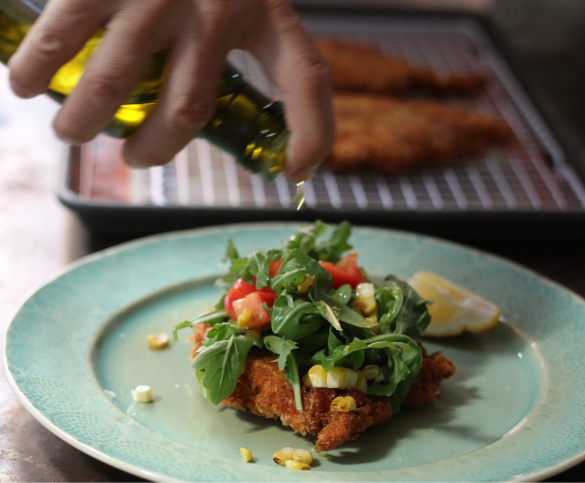 Drizzle with olive oil and squeeze the lemon wedge on top. 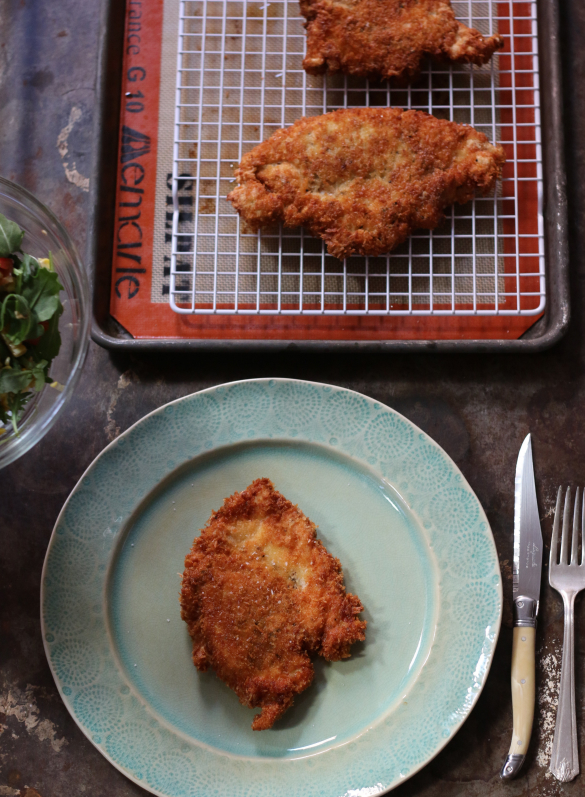 Yes, this reminds me of chicken milanese, but it also reminds me of my grandmother's lightly fried and warm chicken — it definitely turned out to be a winning combination I'm excited to add to the regular rotation. What are some of your childhood memories of meals you recreate now? 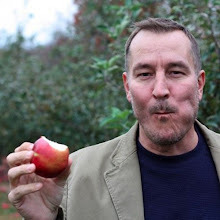 Mmm this looks so good, Tim! I love the salad paired with the crunchy chicken. So true I love a cold crunchy salad on some warm fried chicken!